Booknotes: The Priest, the Archbishop and a very unedifying stoush. The Priest, the Archbishop and a very unedifying stoush. It seems to me that the only thing Father Peter Kennedy, who has been sacked as Administrator of St Mary's church in Brisbane, has done wrong is to have been about as politically and institutionally inept as you could imagine. He couldn't muster the wit to live and work and carry out his progressive ministry in that state of tension and ambiguity within the established institutional church that liberals, dissenters, outsiders and thousands of others over the years have had to do. They've learnt to co-exist by developing a sophisticated survival mode that keeps them sufficiently under the radar to avoid provoking direct rebuke and disendorsement to no-one's advantage. Peter Kennedy, from what I've read, seems a pretty harmless sort of bloke, spruiking a familiar mix of new-agey, Jesus-loves-youse-all, comfort food from his pulpit, and offending no-one, other than the seriously intelligent. 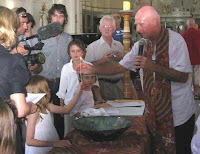 Quaint little liturgical flourishes like not wearing vestments, allowing women to preach, blessing gays, baptising in the name of 'the Creator, the Sustainer and the Liberator of life' instead of the official 'Father, Son and Holy Spirit' are hardly the stuff of revolution or heresy, being more a sign of theological insipidity than informed dissent. It was always going to be possible for the institution to allow Kennedy to operate. But Kennedy, seemingly, did not have the smarts. The Catholic church has survived for 2000 years partly by being fanatical about authority and control, but by also being politically astute and inclusive. It's one of the grand institutions of history, remarkable for its continuing vitality, even existence, in today's post-modern, wise-arse world. It's an institution splattered with the mud of history, rich in its beliefs, liturgies, traditions and articulations, and deserving, I would have thought, of a fair measure of respect from cultured, literate people of any persuasion. Kennedy should have been able to deal with it. It's a measure of the man that he couldn't. The most illuminating book I've read on Catholic politics is Elaine Pagels' wonderful book on Gnosticism. She talks about how the early Church Fathers (sic) recognised that for the Church to go global it had to have a proper control structure, which they duly seized - and thereby deprived women of their rightful (but less hierarchy-conscious) place at the top table. Something big was gained - a global powerbase that has lasted two millennia; and at the same time something valuable was lost - a direct, personal relationship between the individual and God (who, of course, is made in our image). Your closing comment - that Kennedy's inability to handle the politics is a measure of the man - is nicely ambivalent. Are you classing political ineptitude as a virtue in itself, or evidence of a deeper virtue, simplicity or purity perhaps? I'd always thought that the very greatest - Jesus, Gandhi, Mandela - were able to turn their weakness to their advantage, to out-politic the politicians. Spiritual judo, perhaps. Or maybe you're saying the opposite: that the lack of political smarts actually shows him to be a man small in spirit and intelligence? As much as I'd like to claim the ambivalence was intended, it wasn't! I was being fairly cynical.